Ancient Stones - Borders - 024 Riding Stane, Sunderland Hall, Selkirk. 024 Riding Stane, Sunderland Hall, Selkirk. 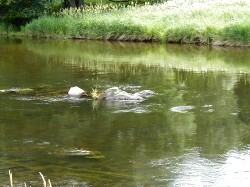 The Riding Stane appears to be simply a large boulder or possibly natural bedrock located in the middle of the River Tweed between The Rink and Sunderland Hall, near Selkirk. There are other stones at the same location. The stone is best reached from Yair Bridge on the A707 from Selkirk to Caddonfoot. On foot, follow the B7060 a short way and take the farm track leading downstream along the north bank. A small lay-by can be seen under the trees just south of Yair Bridge on the B7060. There is also a parking area across the river at the entrance to Lindinny Wood. The stone's name may have been derived from 'rhyd' an Old Welsh word for a river crossing or ford. There does appear to be some indication on the south bank that the location was used as a crossing place in the past. The stone may have acted as both a marker for the ford as well as giving a visible indication to the depth of the river and hence if safe to cross. If you can see the stone, it is safe to cross. If not, the water is too deep for safe crossing. I found a reference to the Riding Stone in a small local interest booklet, Walter's Tales of the Borders by Walter Elliot. It is not shown on the Ordnance Survey's Explorer or Pathfinder Series of maps but can be seen easily of the water level is low enough. 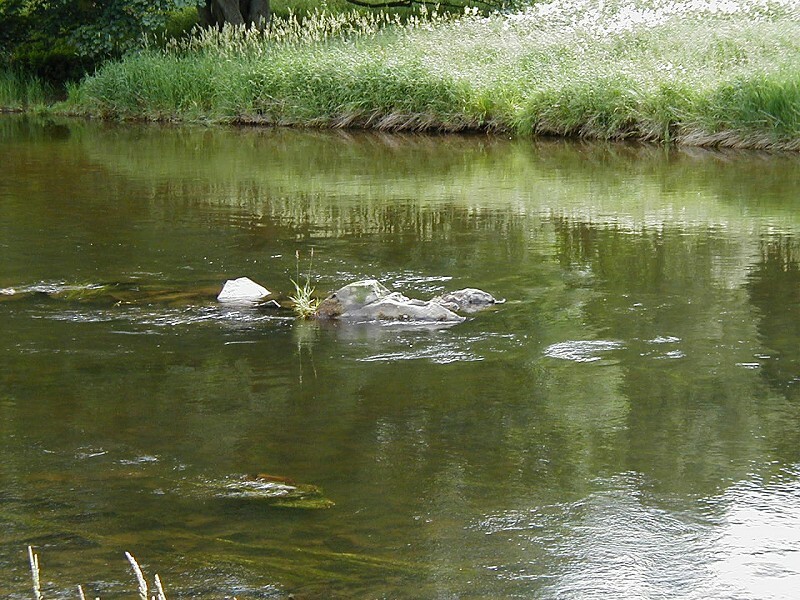 Your best bet of seeing this stone is during the summer months when the River Tweed is not in flood. Two other similar stones have been found in the region. One is the Coot Stone near Walkerburn and the other is the Cuddy Stane near Sprouston, Kelso, however, this stone has not been confirmed as yet. 014 Wallace's Putting Stone, Galashiels.